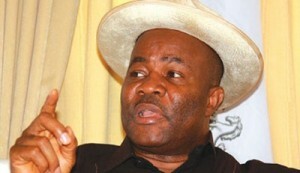 Senator Godswill Akpabio, a former Senate Minority Leader has opened up on why he defected from the Peoples Democratic Party, PDP, to the All Progressives Congress, APC. Akpabio who is a former governor of Akwa Ibom said he defected to APC because he discovered that the former ruling party was about to sink. Speaking in Ikot Ekpene area of the state, during the flag-off of the entrepreneurship/agricultural disbursement of cash grants to his constituents in conjunction with the Small and Medium Enterprises Development Agency of Nigeria, SMEDAN, Akpabio described the PDP has a sinking ship. Akpabio, who is representing Akwa Ibom North West Senatorial District of Akwa Ibom State, said: ‘’You gave me the ticket in 2015 to represent you on the platform of PDP. When I saw that PDP was about to sink, I left for APC. And I can assure you that victory is sure in APC and I thank APC for giving me the ticket unopposed. ‘’During the 18 years of PDP, we didn’t have anything more than the Ministers and Ambassadors, but President Muhammadu Buhari has given us so many things. Works have begun on Ikot Ekpene-Calabar Road, the Ikot Ekpene-Aba road will be dualised and it will be included in the 2019 budget. The Oron-Calabar Road and bridges will be done. You can see why I went to APC. The post “Why I Decamped To APC” – Akpabio appeared first on LATEST NIGERIAN NEWS BREAKING HEADLINES NEWSPAPERS.